Is the sweet, crumbly topping your favorite part of coffee cake? 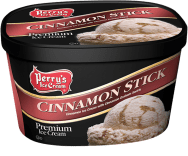 Then you’ll love the delicious cinnamon graham swirled in our cinnamon ice cream. MILK, CREAM, CORN SYRUP, LIQUID SUGAR, CINNAMON BASE [CORN SYRUP, WATER, SUGAR, SWEETENED CONDENSED MILK (CONDENSED MILK, SUGAR), CORN STARCH, CINNAMON, NATURAL FLAVOR, SALT], SKIM MILK, BUTTERMILK, CINNAMON GRAHAM SWIRLS [GRAHAM CRACKER (UNBLEACHED UNENRICHED WHEAT FLOUR, WHOLE WHEAT/GRAHAM FLOUR, SUGAR, PALM AND PALM KERNEL OIL, MOLASSES, HONEY, SALT, SODIUM BICARBONATE), SOYBEAN OIL, POWDERED SUGAR (SUGAR, CORN STARCH), CINNAMON, COCONUT OIL, MONO- AND DIGLYCERIDES, SALT, SOY LECITHIN], MILKFAT, WHEY, MONO- AND DIGLYCERIDES, CELLULOSE GUM, GUAR GUM, CARRAGEENAN, DEXTORSE.